The All-New Zombies, Run! is out now — and free-to-play! – Zombies, Run! The All-New Zombies, Run! is out now — and free-to-play! NOTE: We’re aware of ZombieLink problems with signing in and resetting passwords, and are working on a fix right now. If you’re having problems, please check the “Known Issues” list in the help section of the app. Get ready, Runner 5. This is not a drill. The All-New Zombies, Run! app is here in all its glory, and Season 4 launches today! We’re now giving you unlimited access to every single mission up to the end of Season 3 – plus Interval Training and Race Missions and all 150+ story missions. For free. Your support has kept us going for the past three years. Your season pass purchases, your love of our story and our characters, your feedback and wonderful words of support. You are the engine behind Zombies, Run! Even better, you can unlock one mission of Season 4 every week for free, or upgrade to Pro Membership for unlimited S4 access. Because you’ve supported us, Pro Membership costs only $7.99/year (it’s $19.99 for new players). Android users: You’ll need to download a new (free) app to get access to the new content – but otherwise everything else will be the same. Starting from today, new players can download Zombies, Run! for free. They’ll get access to part of Season 1, plus the ability to unlock a new mission every week. Now there’s no excuse to avoid trying out Zombies, Run! To get unlimited access to all 200+ Seasons 1-4 story missions plus all game modes, free players can upgrade to Pro for just $2.99/month or $19.99/year. We’re really excited about making Zombies, Run! free-to-play. We’ve always believed that everyone will love becoming Runner 5, and now everyone can! We can’t wait to welcome legions of new runners into the most supportive, passionate and wonderful fandom known to the internet. But what about Season 4? It’s already here! The first two missions are available to play right now, with two new missions coming every Wednesday. We’re really excited for you all to play them. We’re always working hard to improve Zombies, Run! every year, and we’re proud to announce a whole host of new features today. Some of these will be coming to iOS first, and others are on Android first. That’s because what’s easy on one platform can be a nightmare on the other – but rest assured we’re aiming to get both versions to parity soon! Gorgeous new user interface: Zombies, Run! has never looked better! Janine’s been hard at work giving every surface a new coat of paint, every menu a polish and every screen that little bit of extra flair. Even better: every mission now has a glorious piece of banner artwork meaning our story now looks as good as it sounds. Recap and teaser clips: Been a while since your last mission? Let our “Previously on Zombies, Run!” clips remind you what’s going on at Abel. Need even more reasons to raise the gates for your next run? The brand-new “Next On” teasers will get your blood pumping and your feet moving. Run log maps in the app: See where you were when Sam professed his love of ice cream rolls, which local landmark you were passing when you escaped that zombie mob, and which hill you crested at that perfect moment in your playlist. Base builder improvements: Getting Abel Township off the ground used to be really tricky. Not enough materials, complicated pre-requisites for buildings, pricey base extensions. That’s why we tweaked the base builder to make it more balanced, easier to understand, and much more fun. Now rebuilding Abel is as much fun as running from it! Mission synopses: You’ve come a long way, Runner 5. Saved the world more times than you can count. Travelled countless miles and outrun danger at every turn. That’s a lot to remember – which is why all missions now have synopses so you can re-live your favourite moments from Abel history. Autoplay your next mission: No more fumbling with your phone. No more split run logs. Just pure, unadulterated binge-running. Improved external music support: Start Spotify, Pandora, or any other music app before you run, and we’ll lower your music volume when Abel Township gets in touch. Wherever your music is coming from, we’ll keep it right there with you while you’re saving the world. Adjustable zombie chase difficulty: Not getting enough adrenaline? Make the zombies faster and more frequent. Getting caught a little too often? Space those chases out or slow those zoms down. Now you call the shots! Customise clip spacing: Out for a short run? Get those clips playing more often so you can fit in the whole mission. Training for a marathon? Spread them out so we’re with you the whole way round. Your run, your way. Apple Health support: Workouts can now be synced with Apple Health, so you can keep track of all your fitness data in one place. Live mission progress tracker: Keep track of exactly how far through your mission you are! No more wondering how many more laps of the track you need to do, no more worrying about whether or not this mission will keep you going all the way home! Even better external music integration: We won’t just lower the volume of music played back by Spotify/Pandora/Google Play Music – we’ll attempt to pause it when Abel needs to get in touch. Your music and our story play perfectly together. A few weeks ago, we said Interval Training would arrive on Android at launch. We haven’t quite managed that, and we’d like to apologise sincerely. As soon as we address any bugs related to the new version, Interval Training on Android is at the top of our list. 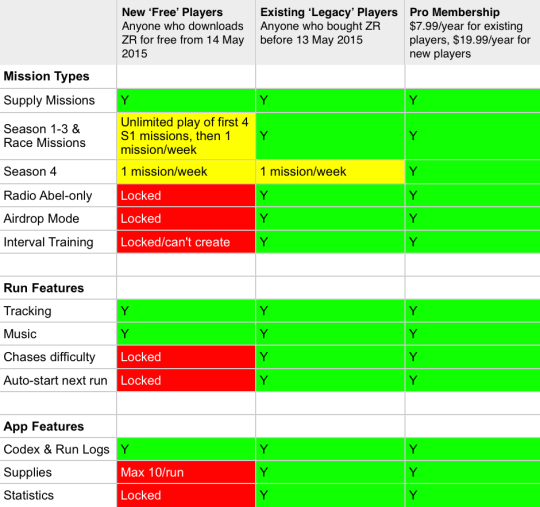 There is some good news though – existing ‘legacy’ players will get Interval Training for free! So: Free access to Season 4, a whole bunch of amazing new missions, great new features, massive improvements to the app. Sound good? Head over to your app store of choice and download the update! If you have any questions, comments or concerns about the latest update or Season 4, leave us a comment below this post, get in touch on with zombiesrungame​ on Twitter, or find us on r/runner5 on Reddit.